This is a recording of the Drive Time Show (Voice of Islam) "Doomsday Clock: Is nuclear war imminent?" The discussion touched on topics such as the global ban treaty and the dangerous situation between the US and North Korea. Scottish CND has received the very sad news that John Jappy passed away. 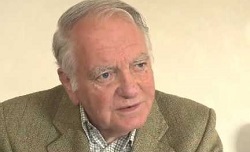 "John Jappy made a massive contribution to Scottish CND and the wider peace movement down the years. I am very sad to hear he has passed away and we are grateful for his commitment down the years." If you want to read John's blog please visit this page.  And any other tasks requested by the line manager. As we start a New Year Scottish CND is working on ideas to continue the struggle to rid our country and our world if the scourge of nuclear weapons. Our plans for 2018 include the organisation of a national Rally at the Faslane Nuclear Weapons Base on Saturday September 22nd. This Rally will be preceded by a March from the Faslane Peace Campaign just outside Helensburgh to the base. It is expected that representatives from peace movements in various parts of the world will speak at the Rally. An invite is also being sent to Scotland's First Minister Nicola Sturgeon to speak at the Rally. One of the main themes of the March and Rally will be the continuing campaign to get scrap the Trident nuclear weapons system which is housed at Faslane. These weapons of mass destruction cost millions of pounds to maintain and this is money badly needed for investment in public services such as health and education. However the March and Rally will also highlight the Treaty for the Prohibition of Nuclear Weapons which was passed at a special session of the United Nations in July 2017. This ground breaking and historical treaty was supported by 122 countries . The treaty opened for signature on September 20th 2017 and will remain open for all states to sign and ratify. Unfortunately the UK Government has shown no signs of recognising the treaty. However despite this lack of interest from the UK Government the treaty has a very good chance of becoming part of international law in the not too distant future. Basically when 50 countries sign and ratify the treaty it becomes part of international law. It will then be binding on those countries not to develop,test,acquire or threaten to use nuclear weapons. Scottish CND are confident that as support for the treaty develops it will have a practical and political impact on the UK Government .If the treaty becomes law it will put nuclear weapons possession clearly beyond the pale. It will also reduce the status or political value attached to these weapons. 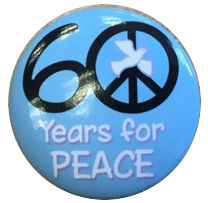 As well as the March and Rally Scottish CND is also planning to organise a number of activities to mark the 60th anniversary of CND. A summer full of outreach activities, street work and stalls at festivals across Scotland "The Nuclear Ban Tour"
The development of a mobile exhibition called Scotland - a Peace of History. This exhibition will look at the Scottish journey of CND and the wider peace movement. It is hoped to launch the exhibition in Autumn 2018 and encourage local groups, schools and other supporter organisations to take the exhibition to various places across Scotland . Peace Education Scotland which is the educational arm of Scottish CND are organising a Youth Peace Campaigning Academy for more than 100 young people. This exciting project will take place in Glasgow in July 2018 and will involve a 3 day programme on all aspects of campaigning work. Sessions will cover issues such as communications tactics, grassroots empowerment and digital engagement. Scottish CND are very worried about a recent announcement by the Bulletin of Atomic Scientists that the Doomsday Clock has moved thirty seconds closer to midnight , with 2 minutes to go. 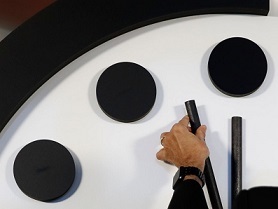 "This is very worrying news about the Doomsday Clock moving dangerously closer to midnight. This news actually means that scientists have looked at the military and political developments of the last year and made the assessment that nuclear war and climate change are more likely to lead to disaster than would have been the case last year."